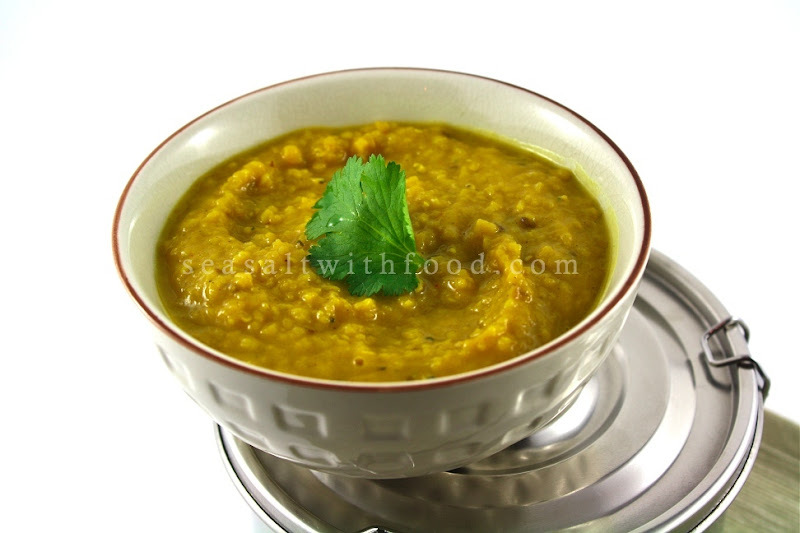 Here I have Red Split Lentils with Cumin Seeds recipe. The split peas are salmon colored; but, will turn yellow when cooked. So, don’t be surprised when you view the pictures. 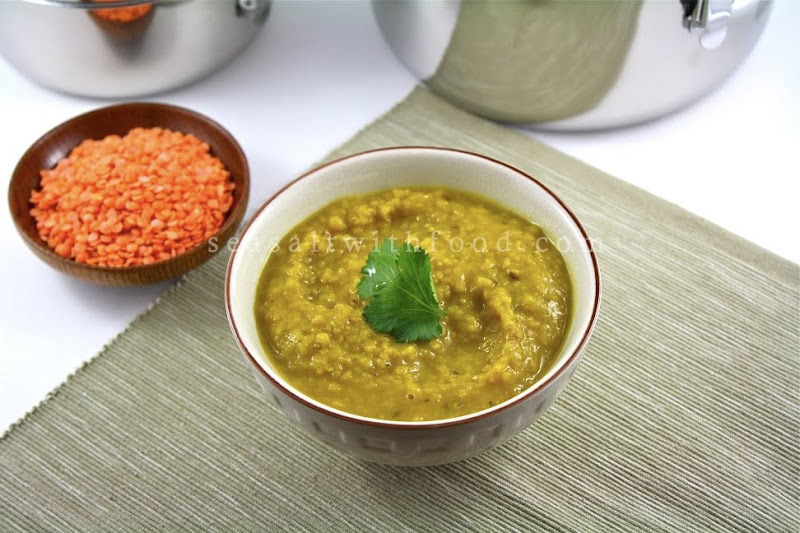 Anyway, serve the lentils with any rice dish, meat, or as a dip with some Naan bread. Just fantastic. Try making your own Naan at home, the recipe is over here. Combine the lentils and water in a heavy pan. Bring to a simmer. Remove any scum that collects at the top. Add the ginger and turmeric. Stir to mix. Cover, leaving the lid slightly ajar, turn the heat to low and simmer gently for 1 ½ hours or until the lentils is tender. Stir every 5 minutes during the last 30 minutes to prevent sticking. Add the sea salt and stir to mix. Remove the ginger slices. Put the ghee in a small frying pan and set over medium heat. When hot, put in the asafetida. A second later, put in the cumin seeds. Let the seeds sizzle for a few seconds. Then put in the coriander and cayenne. 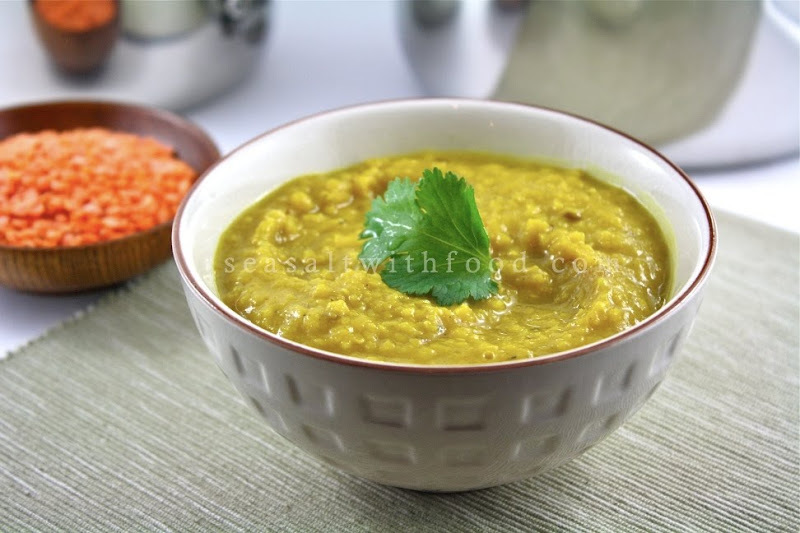 Stir once and then quickly pour the ghee mixture into the pan with the lentils. Stir to mix. Sprinkle the fresh coriander over the top when you serve. Oooh, I haven't made lentils in forever and this just reminded me how much I miss them! Great photos! This looks absolutely delicious. If I were, say, to quintuple the recipe... d'you think the proportions would need to be changed at all? (I may just try this tomorrow and see what happens! =) I love your blog. I spend far more classtime then I ought, drooling over your recipes. shelle, i quintupled & omitted the tumeric. turned out great!